Staples' Sophie deBruijn (23) defends against a shot attempt by Trinity Catholic's MacKenzie Griffin (42) during the girls basketball game at Staples High School on Tuesday, Dec. 20, 2011. 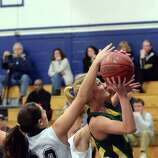 Junior Erica Stein was the offensive hero for the Staples basketball team in its 51-48 home win over Trinity Catholic Tuesday. Stein (21 points, two rebounds, one assist, three steals, three forced turnovers) swished a 3-pointer with 48.2 seconds remaining in the game to break the 48-48 tie with senior captain Jessica Coelho setting a screen to create the opening at the top of the perimeter. "That was definitely a tough shot," Stein said. "She [a Trinity Catholic defender] was definitely on me very tight and luckily it went in. After taking a few shots, I figured I could take it. Jess had to set a screen for me because their defense was on me. She set a good screen, and I quickly got a good look." The Lady Wreckers raised their record to 4-1. The Lady Crusaders dropped to 3-2. "It's definitely a big win for us," Staples coach Ed Huydic said. "It was a hard-fought game from start to finish." Coelho said, "I'm so pumped up and I'm incredibly happy. None of us could hold it in after the game in the team room. We were dancing and celebrating. We were hyped up." Although the Lady Wreckers' lead peaked at 13, 30-17 with 5:33 left in the third quarter, the game was far from over. They led 38-29 at the start of the fourth quarter, which was when Trinity Catholic began to fight back. The Lady Crusaders worked hard to tie the game with junior Ali Palma (12 points, 14 rebounds, one blocked shot) hitting two treys in the fourth quarter to cut it to 41-40. Staples senior alternate captain Sydney Houseworth (eight points, four rebounds, three steals, two forced turnovers) hit a slicing layup to extend the lead to 43-40 and Stein added a trey to make it 46-40. Houseworth had a couple of big layups for the Lady Wreckers, one off a steal and the other on a putback. "Our pressure really helped, and we were on our game," Houseworth said. "Just boxing out and putting a ball-fake helped me get it in the basket." However, Trinity Catholic didn't surrender and tied it 48-48 on junior Kellie Hurd's (12 points) trifecta with 1:14 left off a dish from classmate Siobhan Kirby (five assists, one steal). Following Stein's heroics, Staples saw how dangerous Palma and Hurd were from the perimeter and guarded them like blankets and didn't give them too many open looks. In fact, the Lady Wreckers forced Hurd to miss three treys with senior captain Remy Nolan, junior Nikki Bukovsky and Stein covering her like a blanket. Bukovsky (five points, six rebounds, five assists, three steals, one blocked shot, two tieups, three forced turnovers) played well defensively all night and blocked a shot to preserve the lead. "My offense wasn't hot today, and I stepped it up on defense," Bukovsky said. The Lady Crusaders stayed alive because Bukovsky and Coelho missed the front end of 1-of-1s. But the game wasn't clinched until Nolan (two points, four rebounds, four assists, five steals, one tieup, four forced turnovers), who was making it impossible for Hurd to breath, forced up a third errant shot from international waters. Stein caught the rebound and the game ended. "They came back and we were told to guard the perimeter," Nolan said. "We were told to guard the perimeter with our hands up." Huydic said, "They were hot in the fourth quarter and made timely 3s, but in nitty gritty time, we were gamers." Staples made no field goals in the first quarter and trailed 9-3 after the opening quarter. However, the Lady Crusaders didn't make their shots and failed to take advantage. 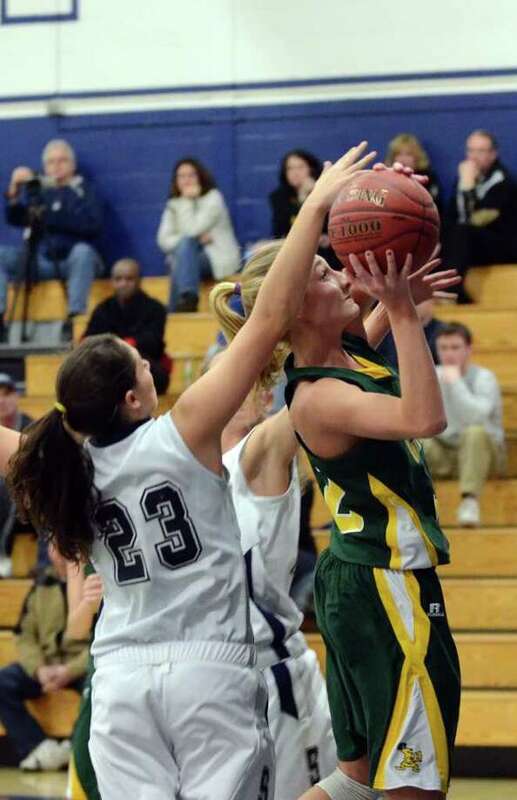 The Lady Wreckers made their shots in the second quarter and took advantage of the press. Overall, they forced 24 TC turnovers while committing 14. Coelho (15 points, eight rebounds, one assist, one steal) scored 11 first half points, eight in the second quarter, to give Staples a 22-15 halftime lead. "We started to get our flow going in the second quarter and carried it to the third and fourth quarters," Coelho said. "I did pretty well in the post, and a lot was driving in and being fouled." However, the Lady Crusaders had a 42-29 advantage on the glass with 6-1 senior captain Mackenzie Griffin (18 points, 11 rebounds, one blocked shot) and the 6-0 Palma leading the way. In the end, the Lady Wreckers were able to hang on. Staples also got contributions from its bench even though it didn't score. Sophomore Sophie de Bruijn (one rebound, one steal, one blocked shot, two forced turnovers) and Freshman Maggie Fair (three forced turnovers) were defensive sparkplugs. Senior Lisa Shirafuji, junior Ali April (one rebound) and freshman Maddie Schemel (three rebounds) also contributed. "The bench gave us quality minutes defensively," Huydic said.